The Doctor’s adventures through time and space over the past 50 years has brought us wonder and the occasional fright. The time is almost upon us for new adventures with a new Doctor and her new best friends with the season premiere just around the corner. The anticipation for this upcoming season with the debut of Jodie Whittaker as the 13th incarnation of our beloved Timelord and well as Chris Chibnall taking over the showrunner duties for this iconic series. 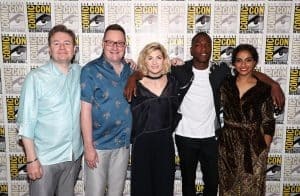 Fans were first introduced to the cast during San Diego Comic Con with Jodie Whittaker along co-stars Tosin Cole and Mandip Gill along with Executive Producer Matt Strevens and Showrunner/Executive Producer Chris Chibnall all on stage in Hall H to promote the upcoming landmark season of Doctor Who. 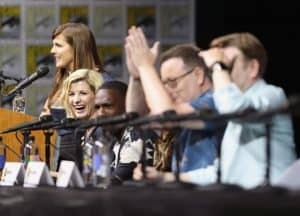 I participated in a press conference prior to the Hall H presentation and that experience provide my with a great first impression of the new Who team. 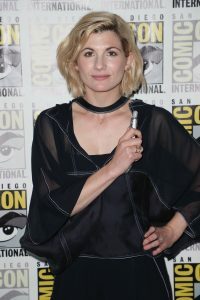 During the press conference Whittaker described playing the first female Doctor as “liberating since the previous rules are all out of the window”. She went on to state that everything is new and making this her own character. Whittaker was careful not to give away much but did say that there were ten stand alone episodes with huge character arcs. In terms of production Strevens discussed finding the balance between practical effects and CGI. The cast joked that they haven’t seen the episodes and they spent their shoot looking at tennis balls. Chibnall stressed that his intention for this 11th season of this modern-era of the series was to serve as an entry point for new fans. Described the upcoming season as exciting, funny, emotion and that there will be “a lot of new villains, monsters, and loads of brilliant guest actors”. 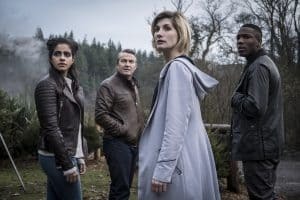 His hope was to make this season inclusive, accessible, and mainstream which would appeal to fans of the series and those who had never watched Doctor Who beforehand. With that said, he is encouraging fans of the series to reach out to their non-Whovian friends to share the viewing experience. Whovians know that each incarnation of The Doctor is different in many different ways from dress to mannerisms. Whittaker looks at the The Doctor as someone with a joy for wonder. She went on to describe the character as fidgety, bubbly, humorous, witty, and energetic. Details on the upcoming season has been kept under wraps and the cast could not disclose too much. 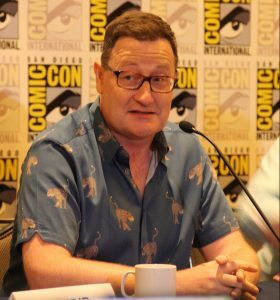 Chibnall stated that he wanted the premiere to be as spoiler-free as possible and he wanted everyone to enjoy the episode from the same starting point. To that end the simulcast BBC & BBC America will undertake will allow everyone to experience the episode at the same time. Chibnall and Strevens discussed diversity and inclusiveness for the cast and creatives behind the scenes. They highlighted that t the staff including writers, editors, and directors include women and people of color. I commend them for taking this direction and providing these opportunities. 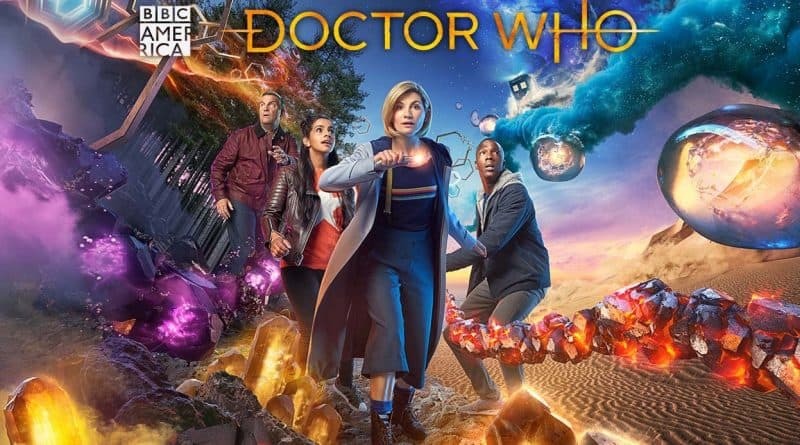 When asked to summarize this upcoming season Chibnall described it as “really flipping awesome” and hinted at the possibility of a bonus episode after the ten episodes have been completed (hint for a possible Christmas episode). For me the role of The Doctor is more than one person, gender, race, or hair color (call back to Matt Smith incarnation of the Doctor’s desire to be ginger). It is an embodiment of inclusion, wonder, friendship, hope, helping others, and solving problems when faced with insurmountable odds. In a few days time the world will get see Jodie Whittaker’s Doctor and I am very confident her time in the role will be BRILLIANT. Set your TARDIS coordinates now – Doctor Who returns Sunday, October 7th at 1:45 ET/ 10:45 PT / 18:45 BST. Are you planning on watching the season premiere at NYCC with fellow Whovians or in the comfort of your own home trying not to hide behind the the couch? Click here to join the Doctor Who conversation on the FoCC forum.